Paul’s Ballparks – Reviews, stories, memoir-through-baseball, stuff I thought about while going to baseball games over my lifetime. 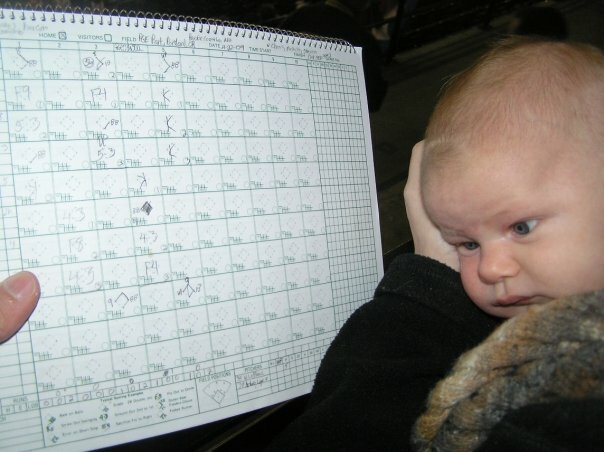 My son learning to score at his first baseball game, April 2009. Welcome to Paul’s Baseball Stadium Pages! These pages have been around for nearly a decade now. They were born in 2001, back when I was a single guy who had been to only 26 major league ballparks and hadn’t even considered moving on to the minors. They were a writing experiment of sorts–a sort of memoir-through-baseball. I wrote them, I liked them, I put them on the internet and left them there. Things are quite different now. For starters, back then, I was a single dude who didn’t mind the confessional nature of the writing. Now I’m a married guy who doesn’t wear his personal life quite as much on his sleeve. My writing has, not surprisingly, changed a bit since then. In fact, I cringe a little bit at some of what I put up for the entire internet to see, and as I make the move now (in 2009) to a new internet home (featuring my own URL! ), I am tempted to edit the old pieces. I have decided to put up the old pages nearly exactly as they originally appeared and leave them be. If you’re thinking “gee, that doesn’t sound like a married guy entering his fifth decade of life,” please note the date-written tag at the bottom of the entry. If things have changed about the ballpark since my arrival, such as its name or its existence, I will update the information in two places: the heading of the piece or the comments. I will no longer update within the body of the text as I used to. Also, keep this in mind: back when I started visiting major league ballparks in the 1990s, I had no idea that I was going to make a website about any of these parks. Therefore, most of the first couple of dozen major league parks are almost entirely without photos (although I’ve since found some 15-year-old snapshots I’ve scanned and uploaded). C’est la vie. If you’ve taken a better photo or two that you’re willing to give me permission to use, let me know via email (paul…at…paulsballparks..dott…you know the last bit). One of the things I have enjoyed most through the years is getting emails from strangers about my writing. I’ve thoroughly enjoyed almost all of them–even the cruel ones, which I find entertaining in their own ways. I continue to invite you to send me an email at the address in the previous paragraph if you have any comments on anything I’ve said. I’m pretty good about responding to them, so don’t be surprised if we wind up in a conversation. Comments, however, I will limit a bit. To make certain the information is relevant and accurate, my plan is to limit who can comment. Click here for details. Navigate along the left however you’d like: by league, by state, by team, by affiliation, or even hit the “random post” key. If you plan on reading them all, I’d recommend going in chronological order: start at my first entry, Tiger Stadium, and just hit “next post” until you’re done. Special thanks are due to my dad, Richard Hamann, for creating the beautiful mashup of ballparks that serves as my banner photo, and to John Ellis for giving me so much of his time and expertise to get this thing off the ground. Enjoy the site. I enjoy writing it.